In the study, the parents and children were observed reading three different formats - printed books, basic electronic books on a tablet and enhanced e-books with features such as sound effects and animation. Dr Munzer said non-verbal interactions, including warmth, closeness and enthusiasm, helped create "positive associations with reading that will likely stick with children as they get older". What books are you reading with your children? 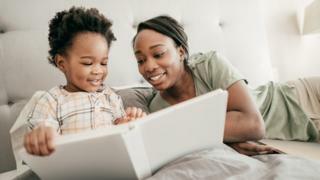 "Reading together is not only a cherished family ritual in many homes but one of the most important developmental activities parents can engage in with their children," said senior author Dr Jenny Radesky. "Our findings suggest that print books elicit a higher quality parent-toddler reading experience compared with e-books. "Paediatricians may wish to continue encouraging parents to read print books with their kids, especially for toddlers and young children who still need support from their parents to learn from any form of media."